Wellies are brillo pads, brilliant! My new ones especially. They may not be psychedelic pink, shaped like donkeys or voice activated but they're MINE and they're HERE. 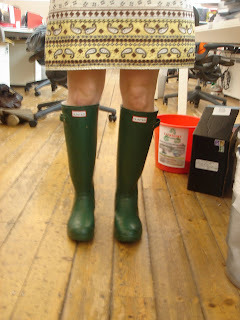 They arrived in the office this morning stirring up yet more Glasto fever (and general wellie envy). I like my new wellies so much I'm almost hoping for (some) rain. Ooops... did I really just say that?